Top 10 reasons you might want to sponsor or give us an red evenlope! You will be attending my wedding ceremony but you STILL WANT to sponsor us. You can't attend my wedding ceremony. You like our idea and website. You don't know how to utilize your cash. You want to advertise in our website. You want to enjoy our happiness. You are Bill Gate (rich). 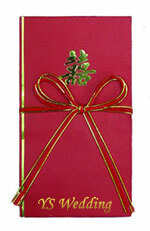 Find out what is "Red Envelope"
Sponsor or give us an red evenlope now!